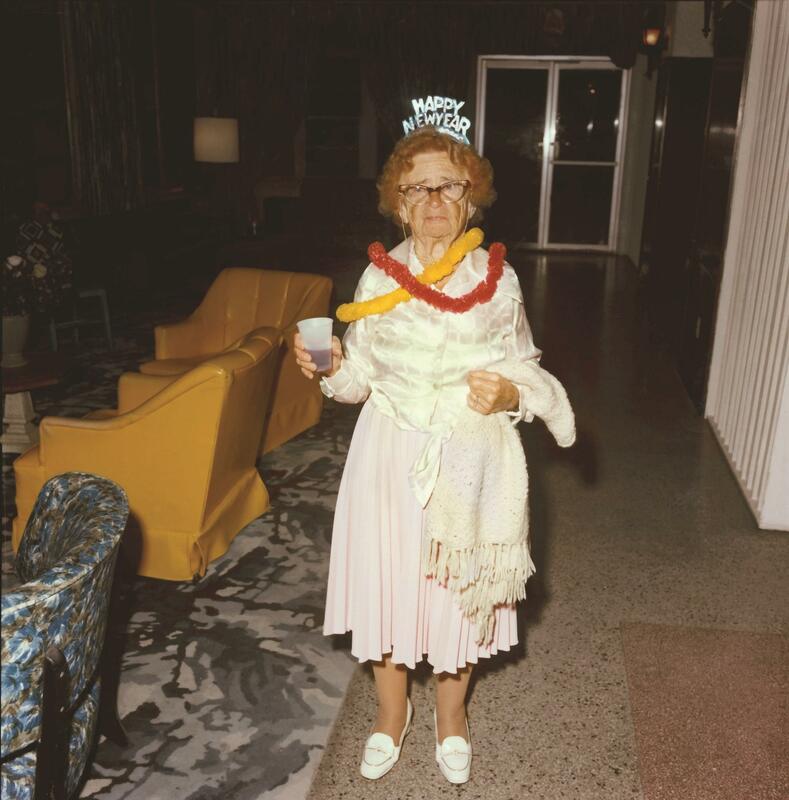 "3 Gals from New York"
Andy Sweet made it a habit of photographing elderly Jewish New Years Eve parties. His sister Ellen says they were usually over by 8. One of Andy Sweet's contact sheets shows which photos he intended to print. The sheets are blown up and displayed as part of the exhibit. As Andy Sweet was finishing graduate school at the University of Colorado, he became particularly attuned to the specific culture of 1970s South Beach, where he'd grown up. He was drawn to the elderly Jewish population that had surrounded him, and it seems safe to say that among men in their twenties, he would have been in the minority. Not unique though. Andy and his friend and fellow Miami Beach native Gary Monroe were getting their master's degrees together, and while they were in Boulder, they made a pact. 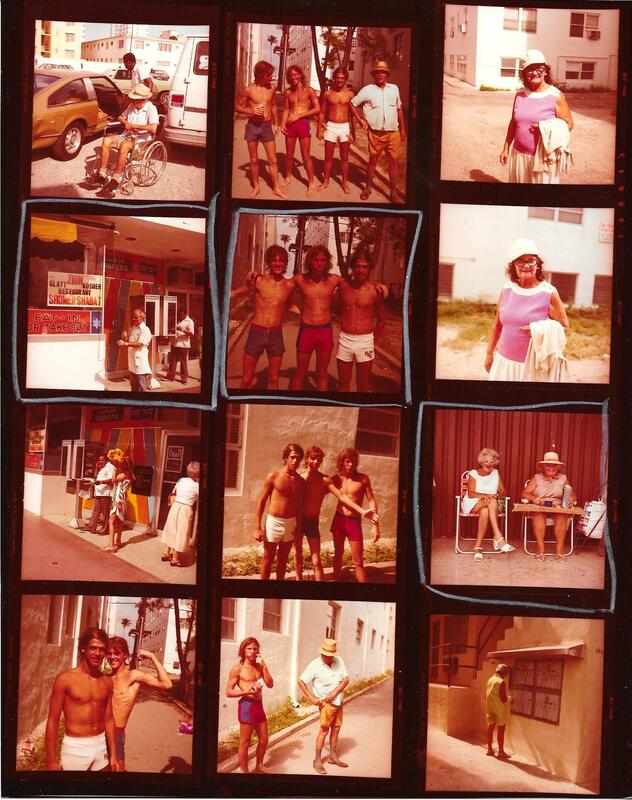 After they graduated, they would come back and shoot photos of Miami Beach everyday for ten years. They started the project in the late 1970s. Gary in black and white. Andy in vivid color. Andy only lived a few more years though. He was murdered in his Miami Beach apartment in 1982, stabbed to death at 28. The circumstances surrounding his death weren't clear, and his family was too devastated to deal with the photographs for a long, long time, according to his sister, Ellen Sweet Moss. What happened to the photographs then is a complicated story involving lost negatives and unexpectedly found prints, discovered by Moss’s husband, Stan Hughes, in a family storage unit. Hughes has spent the last ten years restoring the prints, while he and Moss have worked to restore Sweet’s legacy. "This is the first attempt to tell the whole story," says Ed Christin, the archive's agent, of the Miami Beach Cinemateque exhibit. "I actually saw the photos on Facebook and reached out to them [Sweet's family]. I just loved them so much." Thanks to these efforts, the work of the late photographer Andy Sweet is being discovered again. There’s an exhibition up at Miami Beach Cinematheque through the end of November. Then the photographs move to the Pinta Miami art fair during Art Basel (December 1-4). 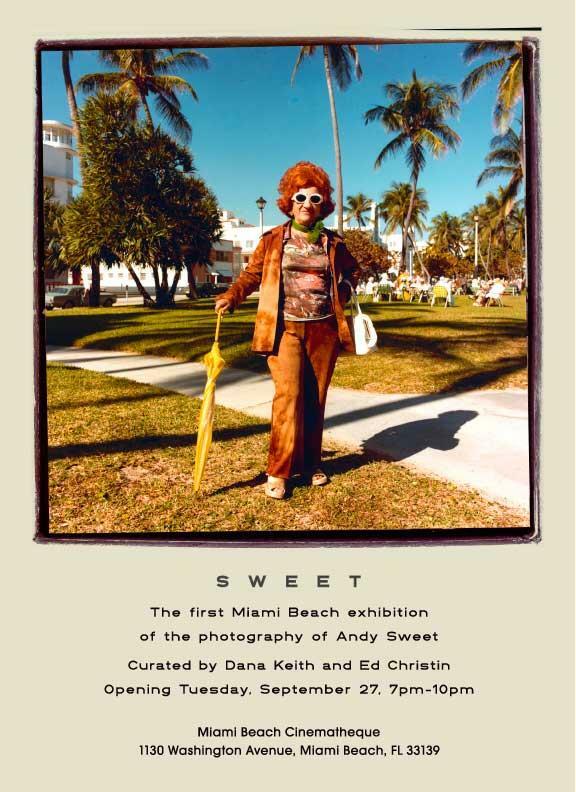 In August, photos by Sweet and his friend Gary Monroe, who's still shooting photographs today, will be part of an exhibition of 1970s and 1980s South Beach photography at History Miami. We asked Andy's sister Ellen Sweet Moss and the archive's agent Ed Christin to describe some of Andy Sweet's photos and discuss what's behind them. Note: Some of the photos referenced are in the slide show above. 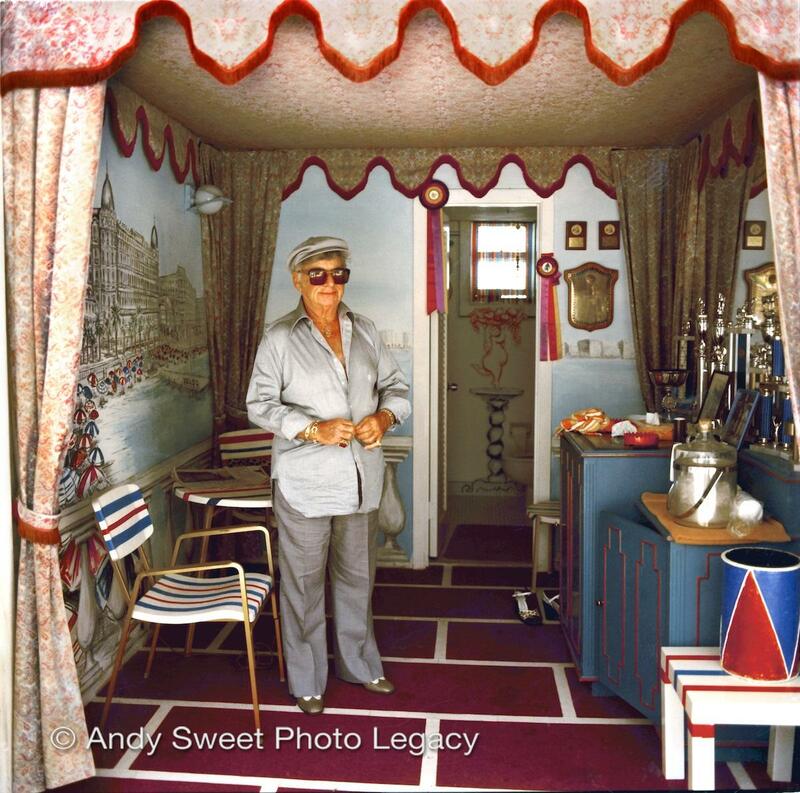 Listen to a discussion about the photographs of Andy Sweet. Edward Christin: If you look at the photos, you see how the physical structures of the buildings in South Beach haven't really changed. They're renovated but because of historic preservation they're basically the same. But the people are completely different. You know, this was primarily a Jewish community at that time. And a lot of them were Holocaust survivors, and they banded together in this little tight-knit community and really supported each other. ... So this is a photo of the Astor Hotel, which is just right around the corner here on Washington Avenue, and you can see these hotels which are now so fancy, they had converted the lobbies a lot of times into makeshift synagogues. This photo here is two people just sitting in an empty room with the television and it's very reminiscent of Diane Arbus, who was one of Andy's idols. He shot very much in her style -- maybe not quite as aggressive as she was. I think Andy had a little too much empathy for his subjects to be quite as tough as Diane Arbus was with her camera. Ellen, you and Andy were at the University of South Florida in Tampa at the same time. And even though you're two years older, he ended up in your photography class. Did he stand out in that class? Do you remember? Ellen Sweet Moss: No, he didn't. He didn't. This teacher was like very difficult, and for some reason I did two pictures, and he loved them and everybody else he gave F's. ESM: Yes. I couldn't believe it. It was crazy. You really get a sense of the beach here. Not just the city of Miami Beach but actually the beachiness. In these photos, Miami Beach looks more like a beach town than, I think, in some ways it feels now. Just looking at these two elderly women sitting in folding chairs, lawn chairs I guess, next to each other -- they look so happy here. And actually there's a lot of photos where people are really smiling directly at the camera. ESM: That's what surprised me because I always felt like sorry for them, all lined up on the porches, like: Oh my God, those poor old people. But they weren't. That's what I realize now. They were happy. Look at this woman, this New Year's Eve woman ... People smiled back at Andy. EC: And all the hotels would have a New Year's party. They [Andy and Gary] would go to like 50 parties. Senior citizen New Year's Eve parties in particular ... That's what's so interesting and unusual. Andy and Gary Monroe were these guys in their 20s, right? ESM: Yeah. And they just had this urgency to do this before it was gone. How did they know that they had to capture this thing, and why were they drawn to this particular aspect of the culture of Miami Beach? ESM: That's something I wish that I knew and had talked to him about. I was such a shallow big sister that was like saying, "It's New Year's. Hang out with me, not the old people." I feel so -- well, it is what it is -- but I just really get it now. The writer Lauren Groff wrote about Andy Sweet's story for the summer edition of Oxford American. You can read that and see more photos here. The tourists keep coming, but many locals stay away from Ocean Drive. People living in Miami Beach will tell you that Ocean Drive has turned into a carnival of rowdy crowds, petty crime and non-stop noise from cruising cars and bars along the street.